- UWFI Sumo Hall (December 20, '92) = Severn took down Yoji Anjoh. - UWFI Budokan Hall (February 14, '93) = Severn beat Yoji Anjoh. - UWFI Budokan Hall (May 6, '93) = Severn was forced to submit to Nobuhiko Takada. - UWFI Budokan Hall (August 13, '93) = Severn & Gary Albright defeated Nobuhiko Takada & Kiyoshi Tamura. - UWFI Shootfighting (October 4, '93) = Severn & Gary Albright were beaten by Salman Hashimikov & Vladimir Berkovich. - UWFI Jingu Stadium (December 5, '93) = Severn & Gary Albright lost to Salman Hashimikov & Vladimir Berkovich. - UWFI Budokan Hall (February 25, '94) = Severn & Gary Albright fell to Nobuhiko Takada & Naoki Sano. - UWFI Shootfighting II (April 13, '94) = Severn was taken down by Masahito Kakihara. - UWFI Budokan Hall (May 6, '94) = Severn & Billy Scott lost to Hiromitsu Kanehara & Yoshihiro Takayama. - UWFI Budokan Hall (October 8, '94) = Severn & Kiyoshi Tamura beat Yoji Anjoh & Steve Nelson. - UWFI Budokan Hall (November 30, '94) = Severn was taken out by Kiyoshi Tamura. - UFC 4: Revenge of the Warriors (December 16, '94) = Severn took down Anthony Macias and Marcus Bossett, then lost in the finals to Royce Gracie. - UFC 5: Return of the Beast (April 7, '95) = Severn defeated Joe Charles, Oleg Taktarov, and Dave Beneteau to win the tournament. - SMW Charlotte Memories (May 20, '95) = Severn stayed the NWA World Heavyweight Champion, beating Bobby Blaze. - UFC 6: Clash of the Titans (July 14, '95) = Severn lost to Ken Shamrock, who became the first UFC Heavyweight Champion. - SMW Superbowl of Wrestling (August 4, '95) = Severn retained the NWA World Heavyweight Title, forcing Bobby Blaze to submit. - IWA Kawasaki Dream (August 20, '95) = Severn kept the NWA World Heavyweight Strap, winning over Tarzan Goto. - UFC The Ultimate Ultimate (December 16, '95) = Severn defeated Paul Varelans, Tank Abbott, and Oleg Taktarov to win the tournament. - NWA 1st Annual Eddie Gilbert Memorial Brawl (February 3, '96) = Severn retained the NWA World Title, beating Al Snow. - UFC 9: Motor City Madness (May 17, '96) = Severn won the UFC Superfight Title, beating Ken Shamrock. - World Wrestling Peace Festival (June 1, '96) = Severn & Antonio Inoki defeated Oleg Taktarov & Yoshiaki Fujiwara. - NJPW Sumo Hall (August 2, '96) = Severn pinned Yoshiaki Fujiwara. - UFC 12: Judgment Day (February 7, '97) = Severn lost the UFC Superfight Title to Mark Coleman. - NWA 2nd Annual Eddie Gilbert Memorial Brawl (April 12, '97) = Severn, as the NWA World Champion, fought to a Double Countout with Dory Funk Jr.
- NWA 3rd Annual Eddie Gilbert Memorial Brawl (February 28, '98) = Severn stayed the NWA World Heavyweight Champ, beating Franz Schumann. - WWF King of the Ring Tournament (June '98) = Severn defeated D-Lo Brown and Owen Hart to make it to the PPV matches. - WWF King of the Ring '98 (June 28, '98) = Severn was pinned by Rocky Maivia in the semi-finals of the KOTR tournament. Ken Shamrock won the tournament. - WWF Brawl For All Tournament (June/August '98) = Severn defeated Kama Mustafa in the first round, but then withdrew from the tournament. Bart Gunn won the tournament. 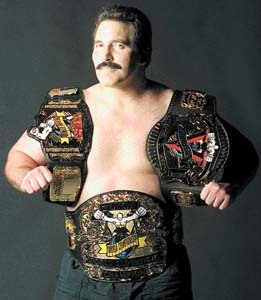 - NWA 50th Anniversary Show (October 24, '98) = Severn kept the NWA World Heavyweight Title, taking down Steve Regal. - WWF Royal Rumble '99 (January 24) = Severn competed in the Royal Rumble, which was won by Vince McMahon. - UFC 27: Ultimate Bad Boys (September 22, '00) = Severn lost to Pedro Rizzo.